Yet, on January 12, two U. S. boats along with 10 sailors surrendered to the Iranian Revolutionary Guard. And like most of you, over the last day, I have watched over and over again on TV, photos and videos of the American sailors on their knees with hands behind their heads. The Navy commander of the captured sailors is on the video apologizing (An apology Biden swears never happened.) and thanking the Iranians for their hospitality. “It was a mistake that was our fault and we apologize for our mistake," said the U.S sailor, who was identified by Iran's Press TV as the commander. "It was a misunderstanding. We did not mean to go into Iranian territorial water. The Iranian behavior was fantastic while we were here. We thank you very much for your hospitality and your assistance." Our groveling Secretary of State, not to be overshadowed by the Navy commander, applauds and thanks Iran for this wonderful new relationship we have with them. It never used to be like that -- Admiral Jeremiah Denton. The Iranians have flashed the images around the world to prove America is nothing but a paper tiger— not much to be concerned with. 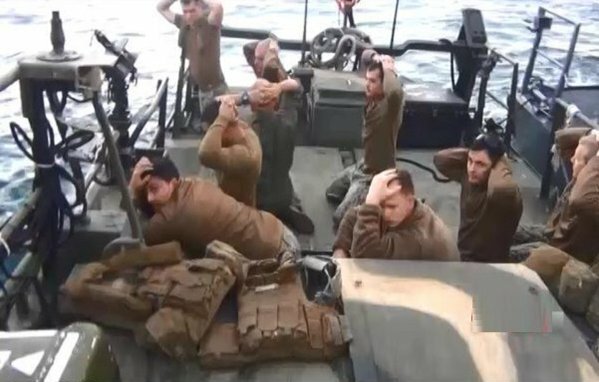 As I watched in disbelief, and anger the videos of the sailors on their knees, hands behind their heads, just like POWs or the victims of ISIS before their throats are slit, and of the young commander apologizing, I keep wondering: was he given orders to “stand down,” and make whatever statement the Iranians demanded for their release? Reports differ on why the boat strayed into supposed Iranian waters: malfunctioned motor, lack of gas, or something else. Nevertheless, clearly the men and boats were heavily armed. They had “the means to resist.” Ammunition and guns were very evident. Did all the guns malfunction? Did their radios malfunction? Was help too far away? Shades of Benghazi. The Pentagon claims they don’t know what happened; that they are investigating. That’s BS. You mean with all their means of communication, they didn’t have a full picture of what happened within an hour.? Congress should investigate right now. Subpoena the sailors. Richard Thompson is a frequent contributor to Spero News. He is the president of the Thomas More Legal Center, a Michigan-based law firm.